Ana Nemec, DVM, PhD, DAVDC, DEVDC, is a veterinary specialist at the Animal Hospital Postojna, Slovenia, and an assistant professor at University of Ljubljana in Slovenia, where she also earned her DVM and PhD in biomedicine. Dr. Nemec completed a residency in dentistry and oral surgery at University of California, Davis. She has been active in several international veterinary dentistry organizations. Her passion is teaching. Rod Jouppi, DVM, is a university veterinarian and the director of the animal care facility at Laurentian University in Sudbury, Ontario. He earned his DVM from University of Guelph. Dr. Jouppi is the president-elect of the Human Animal Bond Association, a board member of the Society of Veterinary Medical Ethics, and a member of the WSAVA Dental Guidelines Committee. He lectures on animal welfare internationally. Paulo V. Steagall, DVM, MS, PhD, DACVAA, is an associate professor of veterinary anesthesiology and analgesia at University of Montreal in Montreal, Canada. He earned his DVM and completed an anesthesiology residency at São Paulo State University in Brazil, where he also earned his master’s degree and PhD with an emphasis in feline analgesia. Dr. Steagall is a member of the Journal of Feline Medicine and Surgery editorial board, the WSAVA Global Pain Council, and the WSAVA Dental Guidelines Committee. He is also the cochair of the WSAVA Therapeutic Guidelines group. Dr. Steagall has published more than 80 articles on pain management in small animals and coedited the book Feline Anesthesia and Pain Management. Assessment of the oral cavity in the conscious patient can lead the clinician to underestimate the extent and severity of oral and dental disease. The following case demonstrates the need for detailed periodontal probing and dental charting, supported by dental radiographs, to fully evaluate oral and dental health, possible association with nasal disease, and appropriate treatment plans. A 10-year-old, 15-lb (7-kg) male crossbreed dog was referred for diagnostic investigation due to sneezing and chronic unilateral nasal discharge that responded temporarily to administration of antibiotics and NSAIDs. The dog had recently been diagnosed via echocardiography with Stage B1 chronic valvular heart disease (ie, myxomatous mitral valve disease)1 but had no other health concerns. Dental cleaning had been performed twice yearly for the past 4 years without general anesthesia; no other at-home oral care was performed. The details of the nonanesthetic dental cleaning procedure were unknown to the owner, but the owner was informed about 2 mobile incisor teeth during the last procedure. The remaining teeth were determined to be in good condition for a 10-year-old dog. A grade II/VI heart murmur and purulent left nasal discharge were noted on physical examination; the remainder of the examination was unremarkable. Oral examination of the conscious patient revealed missing left and right maxillary first and second premolar teeth and generalized moderate plaque and calculus accumulation. Mobility and gingival recession at the right maxillary first and second incisor teeth were noted when the lip was lifted and were suggestive of advanced periodontitis. CBC revealed mild leukocytosis (17 900/μL; reference range, 4000-15 500/μL). Serum chemistry profile and urinalysis results were within normal limits. Premedication was performed with methadone (0.5 mg/kg IM) and midazolam (0.25 mg/kg IM). General anesthesia was induced with alfaxalone (2 mg/kg IV), followed by endotracheal intubation, and maintained with isoflurane in oxygen. Because antibiotic treatment was started again 2 days before the procedure, ampicillin (20 mg/kg IV) was administered after induction in addition to carprofen (4 mg/kg SC). Monitoring included ECG, pulse oximetry, noninvasive blood pressure monitoring, and capnography. A balanced crystalloid solution (1.5 mL/kg/hr IV) was administered. Figure 1 With the patient under general anesthesia and in dorsal recumbency, dental charting and periodontal probing were performed on a tooth-by-tooth basis and revealed advanced periodontitis (PD4) at the right maxillary first and second incisor teeth and both maxillary canine teeth, with an oronasal fistula at the left maxillary canine tooth. The periodontal probe can be seen “disappearing” into the deep periodontal pocket/into the nose, which is characteristic of an oronasal fistula. The oral cavity was rinsed with 0.12% chlorhexidine solution, and a complete oral examination using a UNC-15 periodontal probe and dental explorer was performed and supported by full-mouth dental radiographs. Detailed oral examination with the patient under general anesthesia confirmed bilaterally absent maxillary first and second premolar teeth (previously noted) with apparently intact soft tissue in the areas of missing teeth. Generalized moderate plaque and calculus accumulation were also confirmed and were associated with generalized moderate gingivitis. Mobility of 2 (ie, mobility over a distance of more than 0.5 mm and up to 1 mm)2 at the right maxillary first incisor tooth and mobility of 3 (ie, mobility over a distance exceeding 1 mm)2 at the right maxillary second incisor tooth with gingival recession of 4 mm and probing depth of 6 mm were diagnosed, confirming suspicion of advanced periodontitis. 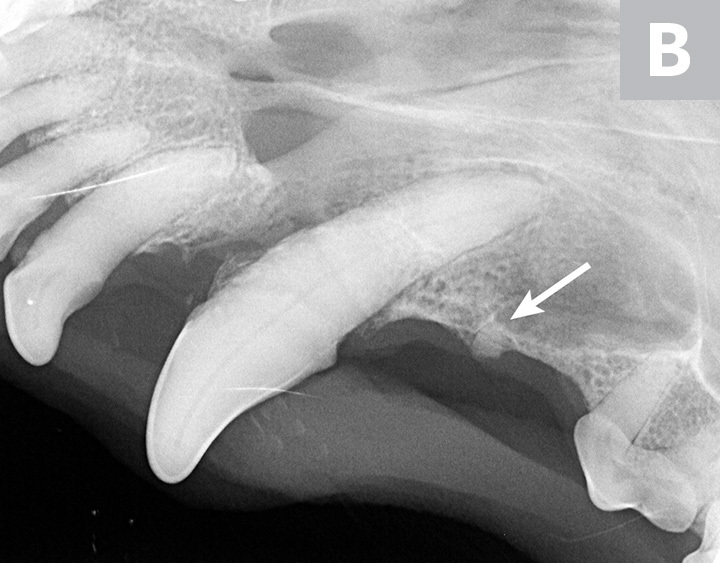 Physiologic mobility of a tooth is considered to be up to 0.2 mm, and normal/sulcal probing depth in a dog this size would be expected to be 1 to 2 mm.2 In addition, probing depth was >15 mm at the mesiopalatal aspect of the left maxillary canine tooth (Figure 1), which also had mobility of 1 (ie, mobility over a distance >0.2 mm and ≤0.5 mm)2; this had not been previously noted on the conscious examination. Bleeding from the left nostril occurred, which was suggestive of an oronasal fistula, likely the cause of the chronic unilateral nasal discharge. Probing depth at the mesiopalatal aspect of the right maxillary canine tooth was noted to be 10 mm, indicating advanced periodontitis at this tooth as well. The rest of the dental charting was within normal limits. Dental radiographs confirmed the clinical findings and revealed a retained root tip in the area of missing teeth (Figure 2). Figure 2 Dental radiographs of the right (A) and left (B) maxillary canine teeth (lateral views) and the rostral maxillae (C; occlusal view) confirmed mild horizontal and severe vertical bone loss at the mesial aspect of both maxillary canine teeth. 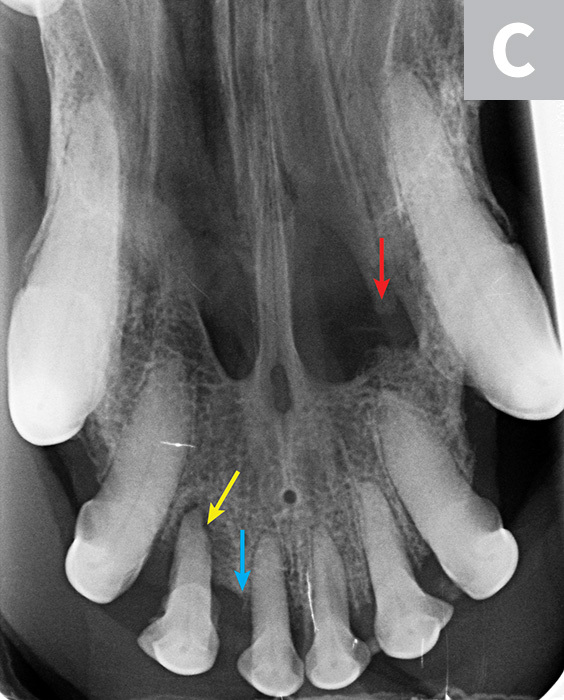 Moderate to severe horizontal bone loss at the right maxillary first incisor tooth (blue arrow) and total loss of attachment with inflammatory root resorption at the right maxillary second incisor tooth (yellow arrow) were present. The remaining maxillary incisor teeth were affected by mild horizontal bone loss. Although the occlusal view of the rostral maxillae is slightly asymmetric, osteolysis was evident in the area of the left palatine fissure (red arrow). Mild horizontal bone loss was diagnosed at several other teeth. In addition, retained root tip of the left maxillary (presumably) first premolar tooth (white arrow) was identified. The dog recovered uneventfully after receiving a second dose of methadone (0.3 mg/kg IV) and was discharged the same evening with carprofen (4 mg/kg PO q24h for 7 days) and topical chlorhexidine mouthwash. Amoxicillin–clavulanic acid (20 mg/kg PO q12h for 10 days) was used to complete the previously started antibiotic course but was also deemed beneficial to treat severe infection of the tissues noted on removal of the left maxillary canine tooth, as well as the previously noted mild leukocytosis. At a 2-week recheck examination, the surgery sites appeared healed and the owner reported resolution of sneezing and nasal discharge. Appropriate surgical management of severe periodontitis and an oronasal fistula4-6 will most likely result in prompt resolution of clinical signs, as in this case. Although supportive analgesic and local antiseptic treatment are mandatory, use of antibiotics in veterinary and human dental patients is highly debated and should be minimized.19,20 In this case, severe local infection and systemic response (ie, leukocytosis) led the clinician to treat the patient with a broad-spectrum antibiotic. This case demonstrates the limitations of an oral examination in a conscious patient, which can lead to underdiagnosing of oral/dental diseases and therefore inappropriate treatment. Anesthesia-free dental procedures often contribute to poor animal welfare, as such procedures may actually contribute to tissue damage and discomfort and pain to the animal without a meaningful result. Pet owners may believe that anesthesia-free dental treatment is sufficient and thus delay appropriate treatment, which can lead to progressive health issues that could negatively affect their pet’s welfare. For more information about the risks of anesthesia-free dentistry, see Suggested Reading. What is the easiest and most cost-effective way to diagnose an oronasal fistula related to severe periodontitis? A periodontal probe is a simple, low-cost hand instrument used to measure probing depth around the teeth. On the maxilla, when a periodontal probe “sinks” along the tooth into the nose, this is evidence of an oronasal fistula. In what percentage of dogs do dental radiographs of teeth without clinical lesions yield clinically important findings? What is the most appropriate recommendation when missing teeth are noted on oral examination in an awake patient? Missing teeth should signal the clinician to obtain dental radiographs, as teeth may be clinically missing for reasons that require treatment (eg, unerupted teeth that may result in dentigerous cyst formation, fractured teeth with retained root fragments). Opioid agonists provide dose-dependent analgesia and are the cornerstone of acute pain management. They also provide mild to moderate sedation, particularly in sick patients. Their cardiovascular effects are negligible. Bradycardia is produced due to increased vagal tone without changes in contractility and systemic vascular resistance. Which of the following is true regarding anesthesia-free dental procedures? They prevent a full oral examination and may cause vitally important diagnoses to be missed or delayed. They may cause patient discomfort, pain, and/or distress. They are likely to delay effective, proper oral care. Performing dental procedures without anesthesia can result in an incomplete oral examination that underestimates the severity and extent of oral/dental diseases and thus delay proper diagnosis and treatment of many possibly painful conditions. Atkins C, Bonagura J, Ettinger S, et al. Guidelines for the diagnosis and treatment of canine chronic valvular heart disease. J Vet Intern Med. 2009;23(6):1142-1150. American Veterinary Dental College. Furcation involvement and mobility index. AVDC website. https://www.avdc.org/Nomenclature/Nomen-Perio.html#periostages. Accessed December 2018. Pascoe PJ. Anaesthesia and pain management. In: Verstraete FJM, Lommer MJ, eds. Oral and Maxillofacial Surgery in Dogs and Cats. Edinburgh, UK: Saunders Elsevier; 2012:23-42. Lommer MJ, Verstraete FJM. Simple extraction of single-rooted teeth. In: Verstraete FJM, Lommer MJ, eds. Oral and Maxillofacial Surgery in Dogs and Cats. Edinburgh, UK: Saunders Elsevier; 2012:115-120. Tsugawa AJ, Lommer MJ, Verstraete FJM. 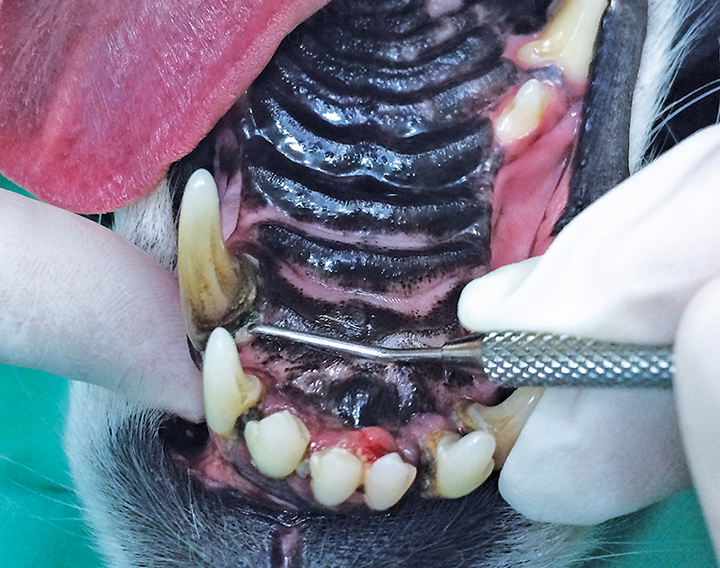 Extraction of canine teeth in dogs. In: Verstraete FJM, Lommer MJ, eds. Oral and Maxillofacial Surgery in Dogs and Cats. Edinburgh, UK: Saunders Elsevier; 2012:121-129. Marretta SM. Repair of acquired palatal defects. In: Verstraete FJM, Lommer MJ, eds. Oral and Maxillofacial Surgery in Dogs and Cats. Edinburgh, UK: Saunders Elsevier; 2012:363-372. Lobetti RG. 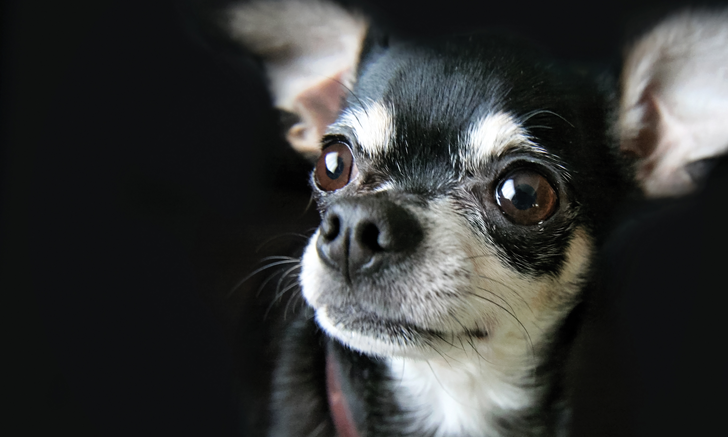 A retrospective study of chronic nasal disease in 75 dogs. J S Afr Vet Assoc. 2009;80(4):224-228. Meler E, Dunn M, Lecuyer M. A retrospective study of canine persistent nasal disease: 80 cases (1998-2003). Can Vet J. 2008;49(1):71-76. Bissett SA, Drobatz KJ, McKnight A, Degernes LA. Prevalence, clinical features, and causes of epistaxis in dogs: 176 cases (1996-2001). J Am Vet Med Assoc. 2007;231(12):1843-1850. Moore JI, Niemiec B. Evaluation of extraction sites for evidence of retained tooth roots and periapical pathology. J Am Anim Hosp Assoc. 2014;50(2):77-82. Tsugawa AJ, Verstraete FJ, Kass PH, Gorrel C. Diagnostic value of the use of lateral and occlusal radiographic views in comparison with periodontal probing for the assessment of periodontal attachment of the canine teeth in dogs. Am J Vet Res. 2003;64(3):255-261. Verstraete FJ, Kass PH, Terpak CH. 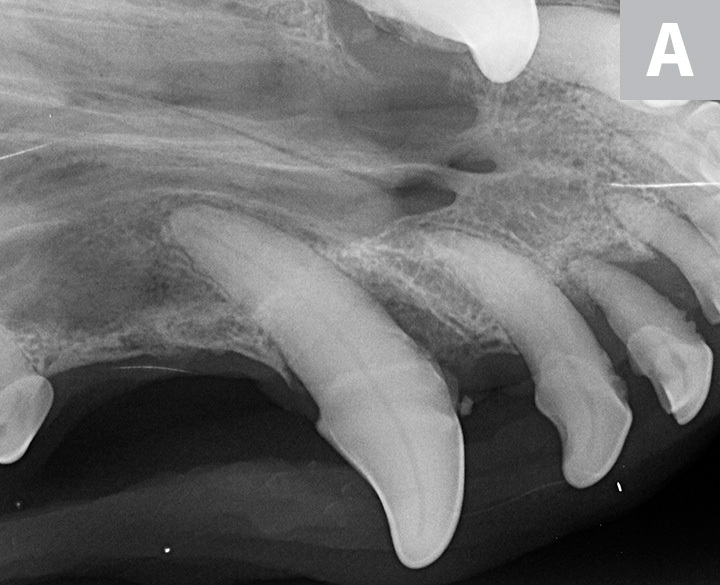 Diagnostic value of full-mouth radiography in dogs. Am J Vet Res. 1998;59(6):686-691. European Veterinary Dental Society, EVDS. A statement on “anaesthesia-free dental procedures” for cats & dogs. https://www.evds.org/policystatements/dentvetwithoutanaesthesia. Updated November 2013. Accessed January 2018. American Veterinary Medical Association. Veterinary dentistry. https://www.avma.org/KB/Policies/Pages/AVMA-Position-on-Veterinary-Dentistry.aspx. Accessed January 2018. Holmstrom SE, Bellows J, Juriga S, Knutson K, Niemiec BA, Perrone J. 2013 AAHA dental care guidelines for dogs and cats. https://www.aaha.org/public_documents/professional/guidelines/dental_guidelines.pdf. Accessed January 2018. American Veterinary Dental College. Anesthesia free dentistry: know the facts. AVDC website. http://avdc.org/AFD. Accessed January 2018. Niemiec BA, Gawor J, Nemec A, et al. World Small Animal Veterinary Association global dental guidelines. https://www.wsava.org/WSAVA/media/Documents/Guidelines/Dental-Guidleines-for-endorsement_0.pdf. Accessed January 2018. Auler Fde A, Torres LN, Pinto AC, Unruh SM, Matera JM, Stopiglia AJ. Tomography, radiography, and rhinoscopy in diagnosis of benign and malignant lesions affecting the nasal cavity and paranasal sinuses in dogs: comparative study. Top Companion Anim Med. 2015;30(2):39-42. American Veterinary Dental College Board of Directors. Policy statement: the use of antibiotics in veterinary dentistry. https://www.avdc.org/Antibiotic_Use_April_2005.pdf. Published April 2005. Accessed January 2018. American Dental Association. Antibiotic prophylaxis prior to dental procedures. ADA website. http://www.ada.org/en/member-center/oral-health-topics/antibiotic-prophylaxis. Updated September 2017. Accessed January 2018. American Veterinary Dental College. Anesthesia free dentistry. AVDC website. http://avdc.org/AFD. Accessed November 2018.